Months ago, I was preparing the third and final part of my "From Corporate America to Working From Home" post and trying to put into words how unpredictable life can be, when Hurricane Sandy hit. While my physical apartment is undamaged, my building was hit hard and my little family had to find a temporary home. I had hoped to write this post when I moved back home and could reflect on what had happened, but alas, I am still staying with dear dear friends (you can't imagine the generosity). I will eventually finish up my Working From Home post. I feel like I'm learning a lot about being flexible and working through those creative slumps, so when I get back home (fingers crossed) I'll finish that up. But right now, I'd rather not dwell on the drudgery of being displaced and focus on... the latest collection from Brooklyn Tweed - BT Winter '13! I just love this collection. I'm amazed, again, that four very different designers can come together and create a cohesive collection. You can definitely see our individuality in each design, but I think they flow from one another so fluidly. This is in large part to Jared's clear and focused direction, but also his faith in us and letting us go with our gut instincts. As a Creative Director, I don't know how he's able to find that balance. It's astonishing. I designed three garments and two accessories for this collection. I love them all for very different reasons. As a designer, Hellebore was invigorating, challenging and so very fun to create. Something hand knitters don't always consider is the work involved in the actual written pattern. Designers approach designs very differently, and I'm still trying to find out what process works best for me. For this particular design, I spent a lot of time on the cabled charts for the sleeves before any actual knitting happened. It was a true test of my Illustrator skills, and while I can say Illustrator got the best of me on some days, I was able to power through and create a pretty cool chart for the sleeve cap, if I do say so myself. Adara is the result of a little test I put to myself. 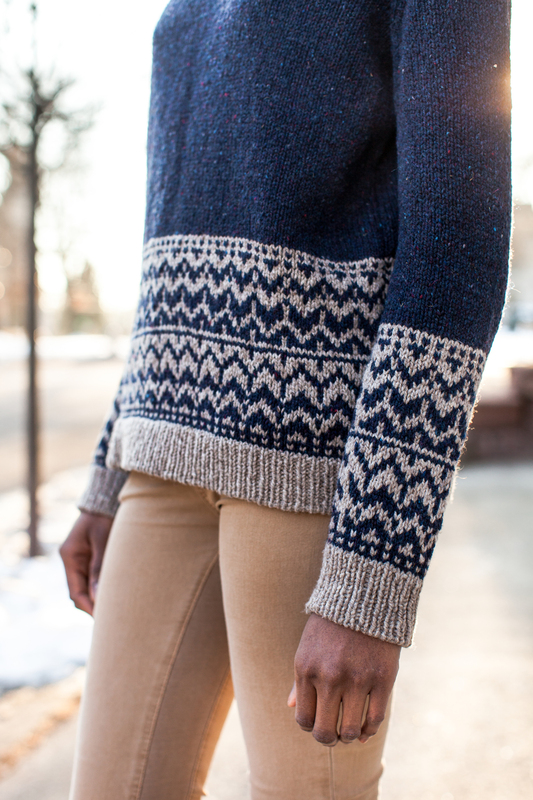 The test was to create a fair isle garment that is modern and easy to knit. While I love fair isle, sometimes I find it too busy, even old-fashioned looking, when it's over an entire garment. Additionally, I don't like "fussy" knits - of course "fussy" has a very broad meaning. But things like steeking or knitting fair isle back and forth qualify as fussy to me. So, the result was a fair isle turtleneck in worsted weight yarn where the fair isle is only knit in the round and only covers a portion of the garment. And if you haven't noticed already, the motif is split in half - the top half is an inverted reflection of the bottom half. And Stowe. I heart this one. Why? Because I just want to wear it and knit. The color, the stitch pattern, and the silhouette all seemed to come together perfectly. The construction on this cardigan couldn't be any easier. Five rectangles, seamed together to make a 2-way cardigan. What could be better? I think I may need one in every neutral color. While I was designing Stowe, I was planning on making it primarily stockinette and was swatching different ribs to put along the opening. Eventually, I reversed it and placed the ribbing all over the garment, and used stockinette along the opening. I liked the natural roll of stockinette and thought it would work better to soften up such a geometric silhouette. Of course Winter wouldn't be complete without some mittens. I love mittens and am convinced they're much warmer than gloves. Maybe not as practical, but since I have to constantly take off whatever is on my hands for my iPhone anyway, I wear only mittens now. 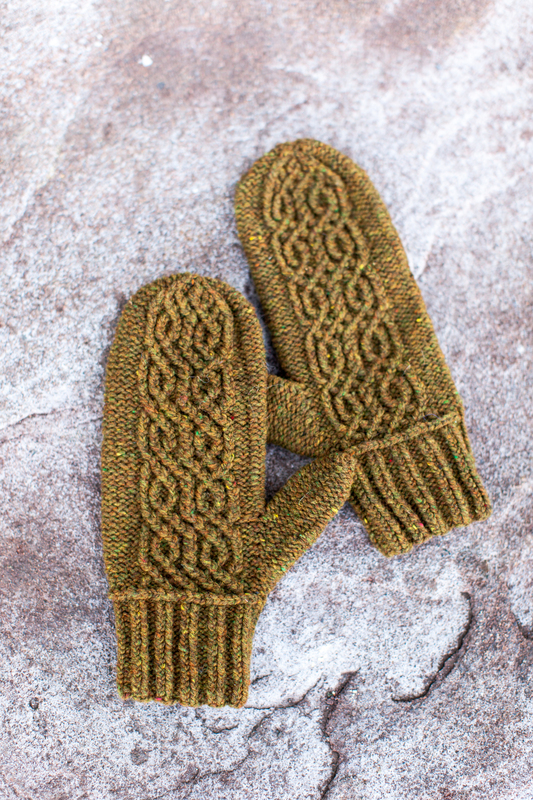 I used Loft doubled for these Knoll mittens so the twisted stitch motif would "pop" a little more. But, I think you could use Shelter if you can get the same gauge. And right above the ribbed cuff, I used a bind-off/pick-up technique to create the braided look. It's really easy and adds some additional interest. And you know me - I love me some cowl. And I'm slightly obsessed with chevrons at the moment. I've been seeing them a lot on interior design blogs, and the "zig zag" has always been one of my favorite quilt patterns. 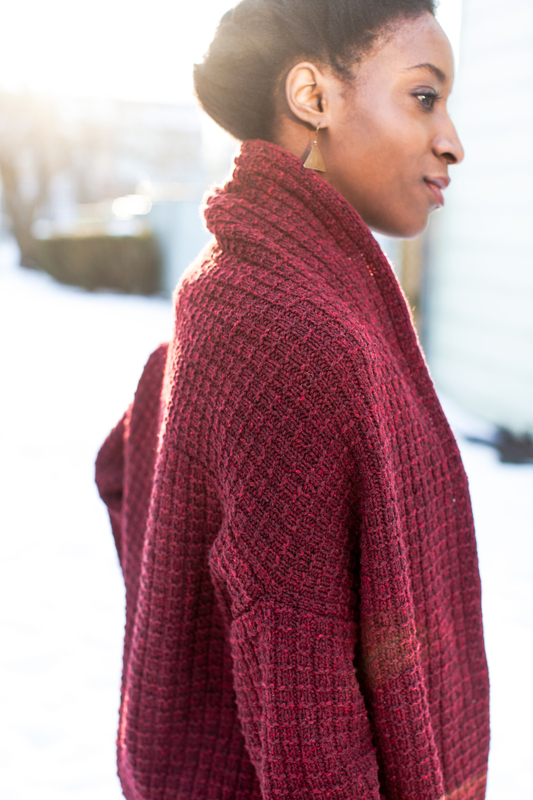 The Warren Street Cowl is also with Loft doubled, but with two similar colors held together, Snowbound and Foothills. The doubling makes the chevrons really squishy and the mixture of the two colors really adds some nice depth. I just love the embossed subtletly of the stitch pattern; it's one of my favorite fabrics in this collection.